In the game of Game of Thrones fan art, you either win or you keep on drawing pictures of Jon Snow cuddling with his direwolf Ghost. Artist Seiji has clearly won with these phenomenal recreations of key GoT scenes and characters translated to feudal Japan, and rendered in that unique style. I don't even want to sully this awesomeness with my words, so I'm including Seiji's titles captions for each piece and nothing else. Just make sure to visit his website here, either to see a bit more of his artwork, beg him to make more, or just to give him a congratulatory "Hodor!". Jon Snow Duels Qhorin Halfhand as Wildlings Look On — "The wildlings are dressed like the Ainu, who are the indigenous people of northern Japan. The Ainu are thought to be the descendants of the first inhabitants of the islands, and throughout history they have lived independently in the cold far north, beyond the grasp of the Emperor." Bran and Hodor Journey North — "Weirwood lore shares some interesting similarities to Shinto practices, so I drew a shimenawa (prayer rope) around the tree trunk." The Execution of Eddard Stark — "Instead of having Ilyn Payne simply execute Ned Stark, an amused Joffrey orders Ned to commit seppuku. Ilyn is on hand to perform the kaishaku, or ritual decapitation to quicken the death. The paper in front of Ned is a death poem, which a samurai would traditionally write before ending his life." Tyrion at the Eyrie — "Catelyn Stark, her uncle Brynden Tully, and a dispatch of the Knights of the Vale journey to the Eyrie while transporting their captive, Tyrion Lannister. Tyrion is dressed in the robes of a nobleman." 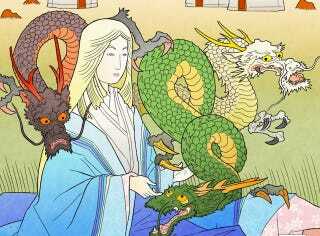 Mother of Dragons — "Danaerys wears traditional Heian-period royal clothing and is seated on the Mongolian Steppes, a fitting analogy for the Dothraki Sea, far from Westeros."